See homes currently on the market in Salem, Massachusetts. Excellent location. Set on a .16 acre lot in the Witchcraft Heights neighborhood of Salem, Massachusetts. Great spot on the corner of Hartford Street and Sable Road cul-de-sac. 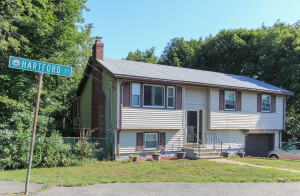 This is a fantastic opportunity to renovate a seven room split level home. The living room has a wood burning fireplace and there is a large family room off the back of the house. There is hot water baseboard gas heat and appliances stay including the washer and dryer. There are three bedrooms and the lower level is partially finished with a bonus room. Also convenient to downtown Peabody.